Visit three opulent highlights of Moscow’s Kremlin — the Armory, Diamond Fund Exhibition and Assumption Cathedral — on a 3-hour morning walking tour! After entering at the earliest admission time to avoid the lines that appear later in the day, immerse yourself in a world of diamonds, gilded décor and intrigue while learning all about the Russian tsars, empresses and presidents who have resided at the iconic Moscow monument. Meet your guide by the Russian National Library in Moscow, and then head inside the Kremlin at one of the earliest admission times to avoid the long entrance lines that appear later in the day. Stroll through the grounds and learn all about Moscow’s Kremlin and its history from your guide. 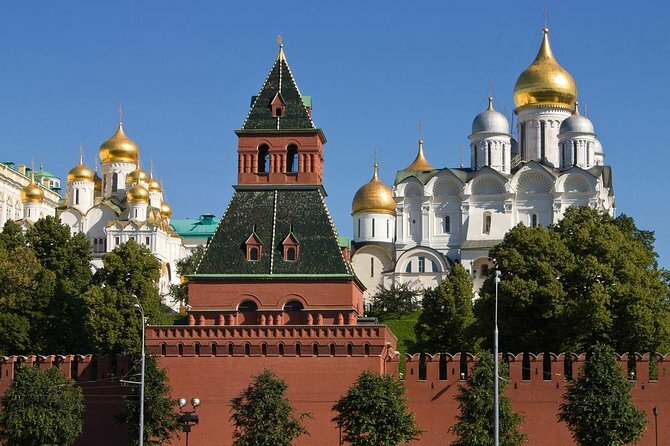 Translating as ‘fortified stronghold,’ the Kremlin dates back to the 15th century when it started life as an imposing castle for the Russian tsars. Centuries of battles, bloodshed, corruption and intrigue followed, and nowadays the site leads a somewhat tamer existence as the residence of the Russian president. Your first stop inside the world-famous site is the Armory, a chamber that boasts enough bling to rival the entire Palace of Versailles. Known to many as the ‘treasure trove of Russia,’ the chamber comprises nine rooms all lavishly embellished with ornamentation, jewelry and Imperial weapons — the spoils of the Russian tsars. Walk around with your guide and discover highlights such as the vast collection of Faberge Eggs that were once given as extravagant Easter gifts, as well as the crowns and thrones of Russian tsars, precious armory and the world’s largest collection of royal carriages. Pass Tsar Cannon, the colossal firearm that seems never to have been fired, and stop for photos in front of the bell tower that encases one of the world’s largest bells. Continue to the Diamond Fund Exhibition to browse an impressive collection of precious stones and jewelry amassed over centuries by the Russian tsars and empresses. See the Crown of the Russian Empire — the richest crown in the Russian Empire — and hear of Empress Elizabeth, the grandchild of Tsar Peter the Great, who contributed a large amount of jewelry to the collection. After admiring the crown, sceptre and orb, walk on to your final site of the tour: Assumption Cathedral. Also known as Uspensky Sobor, the cathedral was the site of several tsars’ coronations, and its interior is cloaked in color and 15th-century artwork. Explore the main prayer hall, and then start to make your way out of the Kremlin. Say your goodbyes to your guide, and then finish your tour at the start point. Our tour guide Ekaterina met us exactly where they text us the day before, she walked us over to the Kremlin and as she did she explained facts about Russia. She was excellent throughout the entire tour, it was great being a private tour only our family. She took us to the Armory , Diamond exhibition and she provided us with the audio and then told us where to wait for her. After that we wanted to have lunch and she gave us tips of where to eat and where to shop. We invited her to have lunch with us after the tour. thank you Ekaterina for a great tour!. Armory, Diamond Fund were great must see places. Privately guided tours and short lines are the only way to visit the Kremlin. The massive crowds of group tourists are still there but our guide was able to navigate through all of this. Thanks Katja. Our tour guide met us promptly at library. Walked through park just outside the Kremlin. I was amazed at how smoothly and quickly we were able to enter Kremlin and museums despite how busy it was. She was very knowledgeable about Russian history and pointed out interesting facts regarding some of items in museum. I am glad she stopped for a quick break in Kremlin gardens for ice cream and drinks, as we were hungry and thirsty. We were not only able to see Assumption cathedral, but Annunciation, and Archangel Cathedrals as well. I would highly recommend this tour to avoid long lines and frustration at the Kremlin. You also gain additional insight and interesting information that you would not otherwise. We had a fantastic tour with Katia. She was incredibly knowledgeable and pleasant to deal with. Her english is impeccable. We were a group of photographers and asked her to show us some of the best spots for pictures and she knew just where to take us. The crowds were fairly large that day and she expertly navigated us through the maze of people. Fantastic tour! Faberge collection and coaches are amazing! Very knowledgeable tour guide. Fabulous. However the Kremlin was not too nice, did not allow her in with us and she tried to get a ticket and also to give us some audio headsets and they did not allow her in a certain area. They then wanted her info. It was very upsetting. She did not do anything wrong, I hope this got resolved. She is a very kind and smart woman. The guide was very knowledgeable and we had an excellent private tour. Over so quickly. A wonderful visit to the Kremlin - our guide Tatiana was extermely knowledgeable and gave us just the right amount of information for our 13 and 17 year old. Amazing to see all the Russian treasures in the Diamond fund and Armory and inside the beautiful churches. Highly recommended.